What a cool book! Iris quilting by Maruscha Gaasenbeek features 16 designs, and I have already turned one of them into a wall hanging! I chose the first design, Heart to Heart, but traced it onto paper instead. It turned out so cool! I will show it on another post as it is almost done. The butterflies will be next for sure, followed by the kites. I love paper piecing - it is super easy, the blocks turn out perfect all the time, and you can 'assembly-line' them to ensure you are using the right fabrics at the right places should you be making more than one block. I will try it using interface rather than paper, sometime. I am so glad I got this book... Of course, there is no more room in my closet-turned-library, yet somehow the books just keep calling my name. 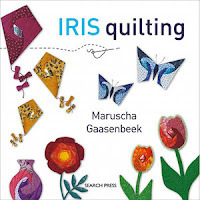 Check out Maruscha's website for more information on her iris folding designs - she has many books on the technique using paper, for your delight if you are a paper crafter!